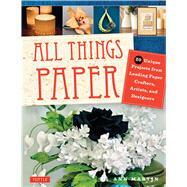 Make beautiful, simple do-it-yourself projects with this friendly guide to paper crafting. You and your family will love to spend hours making beautiful paper art, jewelry, and decorations with All Things Paper. This easy paper crafts book comes with simple-to-follow instructions and detailed photos that show you how to create colorful and impressive art objects to display at home—many of which have practical uses. It is an excellent book for experienced paper craft hobbyists looking for new ideas or for new folders who want to learn paper crafts from experts. All the projects in this book are designed by noted paper crafters like Benjamin John Coleman, Patricia Zapata, and Richela Fabian Morgan. They have all been creating amazing objects with paper for many years. Whether you're a beginner or have been paper crafting for many years, you're bound to find something you'll love in All Things Paper. Soon you will be on your way to creating your own designs and paper art. Ann Martin is the creator of All Things Paper, a blog about the latest on the craft scene—stylish projects, trends, and book reviews. She interviews established artists and features novice artisans with big ideas. Ann enjoys introducing her specialty—quilling—to those who have never seen or heard of the rolled paper art. In addition to designing projects for books, magazines, and websites, she creates custom quilled marriage certificates. Ann lives on the east coast of the United States in the Delaware Valley.